You’ve made it through another Chicago winter so you can finally put away your winter boots, snow shovel, and you can finally ease up on your furnace. But this also means that another hot Chicago summer is on the way. This means bringing out the swim suits, sunscreen, sandals, and making sure your air conditioner will make it through the sweltering months. But if you’ve noticed your AC unit making funny sounds, if it’s not blowing cool air anymore, or if you’ve noticed higher energy bills, these could be signs you need a new system. But with other bills and projects adding to your to-do list for the summer, you want to know if you could just repair it instead. But how can you tell when you can simply repair the unit or when you need a new one? Your air conditioning specialists at Aircore will break it down for you. When you’ve been driving around your Honda Civic for 15 years, you’ll notice it takes more and more repairs in order to be reliable. The same goes for your air conditioner. The lifespan for an air conditioner is between 10 and 15 years, and when it reaches that age, it will begin to break down more frequently. So if you’re facing an expensive repair and that cost could be more than the unit is worth, it’s time to replace it. When it comes to your HVAC system, you’ll definitely want to take into consideration your energy bill. You may just notice that your budget is getting tighter and tighter as the months go by, especially if you do have an older unit, but there are some online tools that help you determine how much you’re spending each month. There can be various reasons for your air conditioner not functioning as efficiently as it could be, including poor insulation in your home, raising temperatures in general, or your AC might not be the right size for the job. So as time goes on, if your AC unit is having trouble keeping your home cool, and repairs are too costly, replace it. Typically, you should be able to repair the unit if it’s fewer than 10 years. One instance in which repairing might not be an option if it’s out of warranty and the repair costs a significant amount. In this case, feel free to get a couple opinions from HVAC companies in Chicago to make sure someone isn’t pulling your leg. At Aircore, our technicians will always provide an honest and professional opinion. If you have an older unit, there’s a good chance it uses R-22 refrigerant. Newer models use R-410a refrigerant and supposedly is more environmentally friendly. The older models are being phased out, making them more expensive to repair. This situation could go either way, so again, take into consideration the age of the unit. The previous reason to replace your AC unit touched on this, but we’ll go into more detail. First, keep in mind that an air conditioner replacement could range between $5,000 and $7,000. Now, take out a piece of paper and a pencil (or your smartphone). If you know how much your current repairs will cost, take that number and multiply it by how old your AC is. If that number is lower than the cost of a new unit, you can repair the unit. If that number is greater, it’s time to replace it. 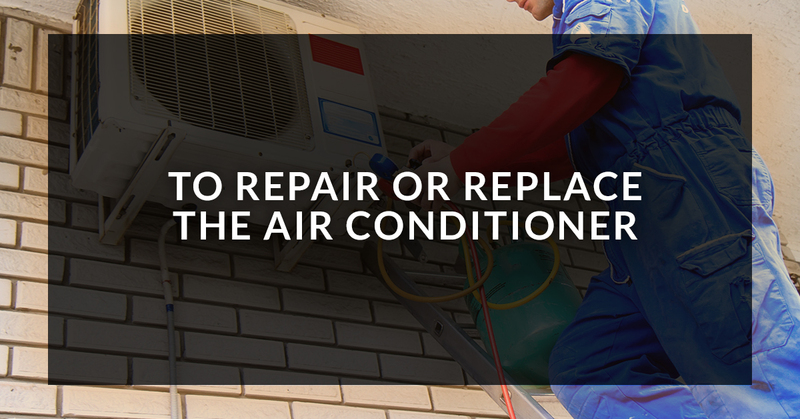 If you’re unsure whether or not you should replace or repair your air conditioner, give Aircore a call today. Our Chicago technicians will be there to inspect the unit and the entire system and will give you an honest and reliable opinion. Give us a call today. Why is My Central Air Conditioner Blowing Warm Air? You may believe running your air conditioner faithfully during summer’s hottest days is enough to keep your home cool. This is not the whole truth: there are many factors that can compromise the air conditioning’s ability to keep your home at the most optimal comfort level. What you Chicago HVAC team is trying to say here is: your air conditioning system cannot alone do the job of keeping your home cool as a cumber. 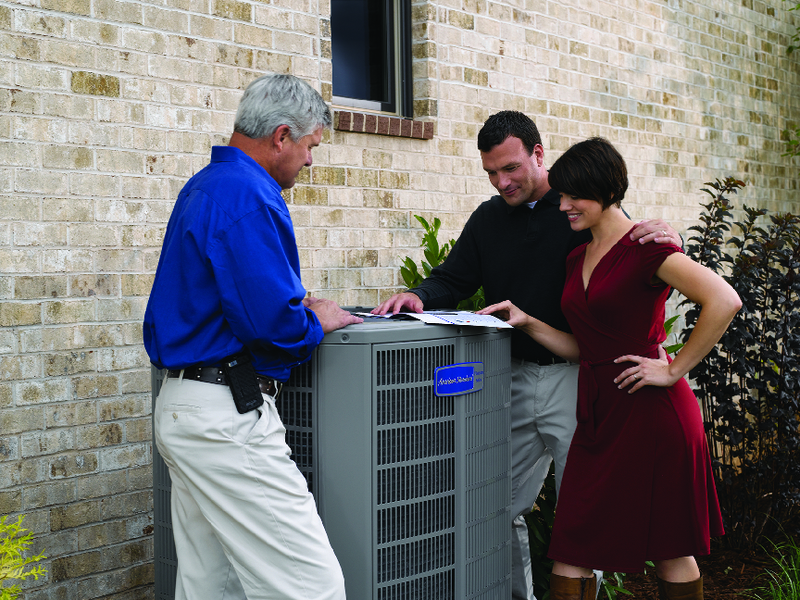 Your air conditioner unit needs assistance to help it run as efficiently as possible. You’ll be surprised to know how many things can cause your home to retain more heat than it should. In this blog, we will explain first how heat in your home happens; what problems with the air conditioning may be impeding its ability to do a sufficient job of cooling your living spaces; and some guidelines on how to support your air conditioner in doing its work. Why is My Air Conditioner Blowing Hot Air Instead of Cold? The laws of physics dictate hot air (conduction) moves towards cool air (convection). Concerning your home, heat from outside is absorbed by your ceiling, windows, walls, and doors. The foundation of your house also absorbs heat. So, you could say the entire infrastructure of your home is under assault by heat waves. No wonder the A / C is not cooling enough. To continue, if your home absorbs heat at a higher rate than the air conditioning can eliminate it, the temperature goes up. This explanation answers the concern: my A / C is blowing but not cold. In the face of all these factors adding to the heat gain of your home, there are plenty of steps you can take to resolve the issue of your home A / C not blowing cold air, lessening the burden on your air conditioner unit to do all the grunt work of cooling. Assuming your air conditioning system has been completely inspected, and all components are in working order; the remedies for the home A / C blowing hot air, even in the midst of oven-like heat, follow. A common source of high heat gain, which interferes with the air conditioner’s ability to cool your home, are minute cracks found around the perimeters of doors and windows, which let in heat from the outside. An ingenious method to discovering where these cracks are is to light a stick of incense. When you are near doors and windows, observe if the incense smoke is streaming vertically or horizontally. If the incense has a horizontal tail, that tells you a crack is present which needs sealing. Besides sealing cracks around the window, you can also buy heavy-weight drapery and blinds, which will further lessen heat gain. In this way, you help your air conditioning unit to optimally perform its cooling operations. When the time comes to have a new roof installed, it’s an opportunity to reduce heat gain in your house. Roofing shingles both absorb and radiate heat. Heat from the roof works its way into your home via the attic and is absorbed into the ceiling. One solution for your attic, where temperatures have been known to rise as high as 150 degrees and beyond, is to purchase an attic fan. Having a dedicated thermostat for just the fan will help to determine at what temperature the fan will turn on to keep the attic cool, holding heat gain at bay. Another facet of shingles, which also adds to the heat gain and affects the air conditioning’s cooling properties, is their color. If they are dark they absorb more heat. This helps in the cold weather months when your home is crying out for heat, but in hot weather it only creates more heat gain. The next time you’re ready to replace the shingles talk to your roofing contractor about what colors are best for both summer and winter months. When you turn on the stove or oven in summertime, you force your air conditioner to toil harder to address the high heat gain these appliances create. A good rule-of-thumb to follow is once the outdoor temperature soars over 90 degrees, cook outdoors on your patio or sundeck. And to put a fine point on it, your dishwasher, clothes washer, and dryer also add to the heat-load demand. Wait until later in the evening when the temperature drops, ideally just before you retire, to turn on the dishwasher, or do a load of wash. Desktops and laptops as well as TVs produce heat, so shut them off when you’re not using them. Shower steam equals heat gain, so ensure everyone in your home uses the ventilation fan in the bathroom. The water heater is yet another source of heat gain in your home during the summer. Use an insulating blanket to wrap the water heater in.As you can see now there are many reasons your air conditioner is blowing warm air in the house. Take the steps we’ve suggested to bring cooling comfort to your home. Air conditioner breaker trips can be either be readily resolved, or require professional attention from an Chicago air conditioning technician. In this blog, we will explore the possible causes of breaker trips. But before we launch into why your air conditioner trips the circuit breaker, we want to explain how an air conditioning split system differs from a single system, concerning breaker trips. Split systems feature two separate voltage circuits, each with a separate breaker. One breaker is connected to the air handler, the other to the condenser. Different issues will cause one or the other breaker to trip; however, it is seldom the case both breakers will trip simultaneously. Power outages, lightening, a faulty transformer, or brown-outs could possibly cause both breakers to trip at once. What Does It Mean When a Breaker Keeps Tripping? Maintenance of your central air conditioning system is a common reason for breaker trips. Condenser coils that have been allowed to build up grime force the air conditioning to use more power. Instead of cooling, the power-rise causes heat to increase. The outcome is the A / C circuit keeps tripping, due to an overloaded circuit. Air filters covered in dirt also cause breaker trips. Make a determined effort to check, clean (if necessary), and in the case of filters, replace them. Keeping your condenser coils and air filters well-maintained will help lower your power bills and decrease the likelihood your air conditioning circuit keeps tripping. Faulty or non-functioning capacitators are another source of air conditioning circuit breaker trips. Two types of capacitators are manufactured: run and start. A run capacitator is used in all air conditioner motors as well as the compressor. The start capacitator only operates the compressor. Capacitators can blow, causing breaker trips. Faulty bearings or a jammed part can interfere with the air conditioner motor’s operation. The motor will end up working overtime to counter the resistance, caused by malfunctioning bearings or stuck components. This will cause a surge in the electrical current, producing more heat. In time, the air conditioner breaker will trip. Loosened wires occurring in any component in the central air conditioner will lead to breaker trips. An example of how this can happen is with the air compressor. Wire corrosion of the compressor results in loosened wires, and the connection is weakened. This problem can be avoided with regular inspection and maintenance visits by an air conditioning professional. During short cycling, the air conditioning motor turns on and off frequently. What happens here is the motor starts from a complete standstill to operating at full capacity instantly. During this very quick startup the motor will set off a surge of electricity, going into overdrive. The increase in heat to counter the inertia the motor’s full stop has created will possibly cause a breaker trip. If the wire size is not correct that also will lead to breaker trips of your air conditioner. If your central air conditioning system is not correctly installed, breaker trips may be in its future. All installations must be performed by a certified HVAC contractor. They understand the installation must conform to the safety codes embedded in the National Electrical Code and the Mechanical Code. 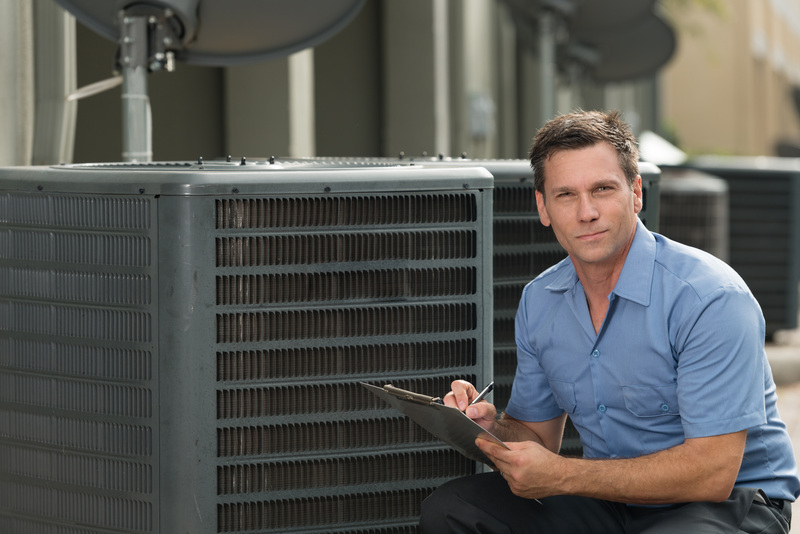 After the air conditioner installation is completed, the air conditioning contractor must contact a municipal inspector, specified by law, to make sure all safety codes have been adhered to. Having this required inspection done will go a long way towards averting breaker trips of your air conditioner. Why Does the Air Conditioner Reset Button Keep Tripping? The A / C breaker tripped and won’t reset? The reason is when breaker trips don’t respond to being reset it indicates an underlying problem of a serious nature. Call an air conditioner professional to come out and find out why your A / C circuit breakers keep tripping. Caution: a final note here to not reset the air conditioning breaker after a few tries. Why is Your Air Conditioner Leaking Water Inside Your House? The moment you discover water dripping from your air conditioning unit—which can result in water damage to your house—take the immediate step of shutting off your air conditioner. Because the water might be affecting the electrical components in a harmful way. The next step is to call in an air conditioning repair professional to take care of the problem. If you’re curious-minded about how the problem of the central air conditioner leaking water inside your home occurs, read on for a basic explanation about how water is created during the operation of your air conditioner, and why water from the air conditioning ends up on your floor. Among the many functions your air conditioner performs, one of them is the evaporation of humidity from the air inside your home. First the air conditioning blower draws hot and moist air through the return grille and sends it to the air conditioning evaporator coil for cooling. The evaporator coil forms condensation in the appearance of droplets much like you find on a cold beverage during hot weather. The water from the evaporator coil then spills into a slanted drain pan, and further into a condensate drain line, exiting either into your plumbing or outside your home. If the condensate drain line, drain pan, or evaporator coil is malfunctioning standing water is the result. A blocked drain line which is filled with debris such as dirt, mold, insects or other matter forces the water to back up into the house. A grimy evaporator coil causes the mixture of dirt and water, which seeps into the drain pan, causing it to become plugged up. If the drain pan has become corroded with rust, enough to allow water leakage to occur, that also causes the A / C unit leaking water on the floor. A secondary problem with the evaporator coil is when it freezes over. As the frozen water melts, and there is a lot of it, it streams heavily above the drain pan, and water dripping from the air conditioning unit results. How does an evaporator coil become frozen? Most often either it’s a grimy air filter, or low refrigerant. An air filter, which has accumulated debris of one kind or another, becomes blocked and prevents airflow from traveling above the evaporator coil. This results in a temperature drop to below freezing, causing the evaporator coil to ice over. If there is not enough refrigerant the evaporator coil will also freeze over. A blocked condensate line is the number one reason for A / C leaking water inside the house. The condensate line receives condensation from the drain pan and sends it into a drainpipe or outside the home. A blocked line causes water backup, flooding the overflow pan. a / c drain line cleaning tool such as a wet / dry vacuum can be used to clear the blockage. But it’s better to be proactive, and avoid a blocked condensate line altogether. You’ll avert water damage and save on costly service calls. Make it a habit to unclog the air conditioner drain line with bleach. After clearing the blockage, use chlorine bleach by pouring it into the line. Do this two to three times a year. If you own a modern air conditioner, the installation of it may be at fault. This could mean a poorly-designed condensate trap has stopped the condensate from draining. The drain pan fills with water and floods your home, causing the air conditioner to drip water inside the house. Another installation issue is a disconnected drain line. This occurs when an air conditioning technician hasn’t had enough experience installing air conditioners and doesn’t attach the drain line correctly. A loosened drain line can result in a water leak. Insulated coils perform the function of allowing built-up condensation to flow down the coil. If the insulation develops fissures or holes, water will drip rather than flow, causing the A / C unit leaking water on the floor, with the potential of water damage if you don’t discover the problem soon enough. Why is My A / C Running All the Time? Air conditioners run in cycles, turning off when the desired temperature for cooling is reached, and turning on when the temperature rises again, affecting the comfort level of your home. But when the air conditioner runs continuously, something is amiss with one or more components of your air conditioning unit. Below we give 6 steps to troubleshoot why your air conditioning is running constantly instead of in cycles. When the air conditioner unit is under-sized it has to work 24 / 7 to provide cooling relief to your home. The constant operation causes more wear-and-tear as your air conditioner ages, and in the bargain shortens its service life. Operating endlessly to try and achieve the optimal comfort level for your home it will fail to do so, even though it never stops running. Also, you may find your air conditioning unit breaks down when it shouldn’t, unless it is nearing the end of its lifespan. An over-sized air conditioning unit cannot capably evaporate too-humid air in your house. The result is too much moisture and mugginess occurs from the ineffective operation of your air conditioning system. It will also consume too much electrical power and jack up your power bills. The sizing of your ducts can also be a problem. They should be comparable with the size of your air conditioner system. When ducts are the incorrect size, they could have a problem managing the airflow, or delivering cooling air to every part of the house. If sizing of your air conditioning unit and ductwork is complementary, then the next step is to check your filter. The air filter quickly collects dirt and debris reducing the air conditioner’s ability to output cool air. The outcome is your unit’s air handler will have to labor more to make up for the difference in your air conditioner’s reduced ability to provide cool air. Also, a grimy air filter causes your system to overheat as a result of running harder and incessantly. To keep airflow free and unrestricted, either clean or install a new air filter. This should happen on a monthly basis, or according to the manufacturer’s recommendation. The coils must be free from such impediments as grass leavings, pet hair, and mud because they will obstruct airflow. Reduced airflow will weaken the air conditioner’s operation and efficiency, which can cause it to run without stopping. The cleaning of condenser coils is easy to do to maintain air conditioning efficiency. Just hose them down. But don’t do this until you shut off the electric power beforehand. Evaporator coils are a different matter since they can’t be easily reached. To explain further, an evaporator coil constantly receives blower airflow, injected with dust and dirt. As a consequence, when air particulate matter lands on coil surfaces and accumulates, necessary heat transfer coming from the air enroute to the refrigerant is compromised. This affects the cooling operation and increases the cost of running the air conditioner. The increased cost happens because the unit has to operate on extended “on” cycles just to agree with thermostat settings. Why is My A / C Running Constantly, But Does Not Shut Off When Set Temperature is Reached? If your air conditioning keeps running after the temperature is reached, the thermostat may be the reason. It’s possible your home is at the proper temperature; however, the thermostat does not agree with the “felt” temperature. This disconnect between “felt” temperature and thermostat setting could cause your air conditioner to keep chugging along. A method to find out if the thermostat is faulty is to put a thermometer close by the thermostat. Give it one to two hours, and then take a reading. If the thermometer registers a temperature approximate to the “felt” temperature in the home, the thermostat may be at issue. Air leaks and inadequate insulation can also interfere with the air conditioning’s normal on-and-off cycles. Air leaks cause loss of cool air through gaps, and places where insulation has not been installed, such as behind walls or beneath the roof. Loss of cool air hampers the ability of the air conditioner to achieve the optimal temperature for the comfort level of your home. This in turn forces the air conditioning to run excessively. You’ve heard this before: air conditioning units must have maintenance done to keep them operating optimally. The reasons we have enumerated so far tells you why. Maintenance on your air conditioner should be done both in the spring and at the beginning of fall. Your unit needs its ductwork, coils, and air filter inspected, and if warranted, cleaned. If your system is not inspected by a professional at these regular intervals, chances are airflow and cycling issues will happen, causing the unit to operate inefficiently. And in some cases, to have the air conditioner running all day. Warm weather is not far off, specially in Chicago where oppressively hot days are the norm, you want to make sure your air conditioning unit will be able to handle the job of keeping your home cool. You especially want to avoid an emergency repair call if you can. The best way to reduce the odds of needing an HVAC air conditioning repair technician to come to your home that has now become a sweat lodge is to take some proactive steps to maintain your air conditioner unit in top working order to forestall its needing repair work done on the dog days of the year. If your air conditioning unit is not functioning, before you call an HVAC air conditioning repair technician to come out and find out what the problem is and possibly do repairs, here are some steps you can take to troubleshoot your air conditioner system beforehand, and maybe solve the problem yourself. It’s possible the circuit breaker has tripped. Are you running more than one appliance, using your lights and TV? Too many household items running at the same time can cause an overload of juice, causing the circuit breaker to shut off. Checking the circuit breaker to see if it has tripped, and returning the lever to its on position—if it has—will make you heave a sigh of relief you don’t have to spend money on repairs. Inspect your thermostat to see if it has shut off, or only the blower fan is operating. A battery-operated air conditioner may only need the batteries replaced. A grimy and blocked filter will interfere with air flow and lower cooling efficiency. Sometimes a filter that has gotten dirty and clogged can cause your air conditioning unit to form ice. Regularly inspect your filters and change them often to prevent the air conditioner from malfunctioning. Built-up ice on your AC air conditioning will interfere with its cooling feature. There are two methods to dealing with ice buildup: 1) shut the air conditioner unit off and operate the fan to aid in melting the ice fast. 2) turn off the air conditioner unit and wait for the ice to melt in due time. Check your ductwork to ensure you’re getting enough air flow. Dirty ducts will certainly impede airflow, so clean them if they need it. And while you’re checking your ductwork, look to see if a register has inadvertently been completely closed. Even a partially closed register will obstruct airflow to the ducts. The entire AC air conditioning unit may just need a good cleaning to get it operating again. Consider giving the air conditioner unit a thorough cleaning before you determine it needs repairing. For the outside air conditioning unit, conscientiously wipe the fan blades and condenser fins. Caution: don’t try to clean the air conditioner unit while it is running. If it turns out your HVAC air conditioning system is actually out of commission, call an HVAC air conditioning repair technician to come out and discover what the real problem is. They will do a complete inspection of your air conditioner unit, pinpoint the problem or problems, repair them, and have your air conditioner unit up and running in no time. Depending on whether you need a central air conditioner unit installed or a window central air conditioner add-on, you can expect to pay as little as $150–$300 for a window unit, or as much as $7,000 for a central air conditioner unit (this figure depends on the square footage of your house). If your house needs ductwork you can about double your cost. The total expenditure for the job will depend on the type of system you choose. This system uses a one-two punch, combining ductwork with your heating system to air condition your entire home. AC air conditioning units can also be categorized as single-stage and two-stage cooling. Reliant on the climate in your area, a single-stage or two-stage cooling unit will be recommended by the HVAC air conditioning repair technician. Single-stage runs at maximum capacity when the indoor temperature exceeds your thermostat’s setting. Then it shuts down until the temperature exceeds the thermostat setting again, cycling repeatedly in this manner. Single-stage is best for hot, muggy weather. Two-stage air conditioning units operate at maximum capacity, or two-thirds of maximum capacity. Depending on the temperature inside your home it will choose either single-stage or two-stage. Operating at two-thirds of maximum capacity will help save energy while simultaneously cooling your home. Two-stage is less noisy, produces purer air, and is cost-efficient. BTU is an acronym for British Thermal Units, and are a factor in the type of air conditioning unit you’ll require for your house, based on its size. Good to know is if the air conditioning unit is undersized the unit won’t be capable of cooling the house completely when it’s sweltering outside. And the cost to run it will increase because it will take longer to cool down the space. If the unit is oversized, it will also be more expensive to run due to the need for more electricity. Lowering humidity will also be an issue. Cooling the air too quickly interferes with the volume of air circulation, which slows down moisture extraction, leaving the air feeling sticky. 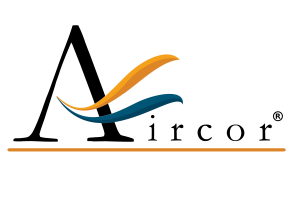 EER, the energy efficient ratio, applies to the cooling efficiency of air conditioning units. Each air conditioner is certified according to its EER. SEER, seasonal energy-efficiency rating, determines the number of BTUs an air conditioning unit will displace per watt of electricity used up. A high SEER rating of 13 and above means the air conditioner unit is cheaper to run, will usually be of higher quality, contains more safety features, is less noisy to operate, and less energy will be expended. You can typically expect to pay more for an air conditioner with a higher SEER. Federal government regulations now require new AC air conditioning units meet a SEER 13 minimum rating. If you’re going to have either a central or split air conditioner installed, a HVAC air conditioning repair technician will be necessary for the installation process, Why a professional? A component of the air conditioning unit is refrigerant, a toxic chemical. Refrigerant cools the air and it can be only be handled by an EPA-licensed HVAC air conditioning repair technician. A HVAC air conditioning repair technician, who performs the initial assessment and determines the type of air conditioner you need, heads a team of assistant repair technicians. They will aid in doing the wiring, ductwork, and other operations necessary to install the AC unit. All of this will cost you more coin. Ask the HVAC air conditioning repair technician if purchasing the AC air conditioning unit yourself will cut corners on expenses. You could also ask them if the heating system ductwork already in place can be used to further defray your expenses. Ductwork is necessary to support the air conditioning unit with air flow. If your home is relatively new you’ll have ductwork already installed. But if you’ve a much older home it’s probably outfitted with a convection heating system or baseboard heater sans ductwork. In this instance, in order to install a central air conditioning unit, you’ll need to also install ductwork and venting. Central air conditioners have a 5–15-year manufacturer’s warranty, covering equipment and parts. The contractor’s warranty, also included, covers labor when the air conditioner needs repairing. You can also purchase an extended warranty, but if you maintain your AC air conditioning unit religiously, the prohibitive cost of an extended warranty may not be necessary, saving you money. You may claim a lifetime credit maximum of 10% on your expenses to purchase and install an HVAC system, or any other energy-savings enhancements. The amount you can claim is capped at $500.00. The time period to install an energy-tax-credit-eligible HVAC system expires on January 1, 2017. This means you must file by December 31, 2106. Keep the manufacturers’ warranties, certifications, and purchase receipts. You may need them to file the IRS Form 5659. For an eligible oil furnace or hot water boiler, propane, and natural gas units $150.00 is the maximum you can claim. In the category of energy-efficient eligible products items would include central air conditioners and geothermal pumps, as well as the items listed in 2. The cap is $300.00. But please check on all this information, which is the most accurate available to date. Because it’s hard to keep up with the IRS guidelines as they are subject to change without warning for the consumer. Energy Star on its website lists guidelines on the HVAC systems the federal government covers. Not every Energy Star-certified product is eligible for the energy-efficient tax credit. Energy Star is a reliable resource you can turn to for the correct information, in lieu of some contractors, who remain ignorant of the finer points of the energy-efficient tax credit program. Don’t depend on them. They will say anything to make a sale. With the incentive to upgrade to green-energy HVAC products it is possible to lower your energy bills as much as 20% yearly. The average annual savings amounts to about $200.00. Your initial outlay will cost you but keep in mind the energy-savings down the road that will bring a return on investment. For a high-efficiency heating system expect to pay about $3,500 inclusive of installation, whereas a conventional heating system will set you back around $2,400. Purchasing an Energy Star-certified product does not guarantee you can claim the energy-efficient tax credit in all cases. There are standards to be met to get the energy-efficient tax credit. The annual fuel utilization efficiency (AFUE) rating must exceed a conventional heating system’s AFUE. For Energy Star-certified oil furnaces they must rate at 85% energy-efficiency, while some gas furnaces need to burn fuel at 90% efficiency. The Department of Energy asks for even higher AFUE ratings to claim the energy-efficiency tax credit: for natural or propane gas furnaces 95% and oil furnaces 95%. Boilers must also consume energy at an AFUE rating of 95%. Cooling system ratings known as seasonal energy-efficiency ratio (SEER) and energy-efficient ratio (EER) are Energy Star standards. The ratings vary according to the type of system: split system ratings are SEER 16-plus and EER 13-plus. For package systems, SEER 14-plus and EER 12-plus. These efficiency standards can change without notice, so double-check them on the Energy Star website. It usually takes about 10 years in energy-efficient savings to compensate for the expense of investing in new heating and cooling systems. But this time period can alter significantly if there are changes in fuel prices. A value-added benefit, although not evident in your initial investment in an HVAC product, is the reduction of your carbon footprint on the environment, as well as a more comfortable indoor environment for you and your family. Another benefit to consider is when you sell your home. It’s not that the few thousand dollars you’ve spent to buy a heating system will translate to an increase in your home’s sale price. Potential savings will come in the form of a trade-off with some buyers. This means buyers may not ask that you repair your HVAC system, or bargain for a credit as long as your HVAC system is up to snuff. Green-energy products are incentivized at 30% of the purchase price. This tax credit has no cap in many cases, the exception being fuel cell property, capped at $500 depending on kilowatt usage.